Anika, 12, might seem like your average middle schooler. She likes to draw, loves science fiction and has an Alaskan Malamute named Niko, but, when the Audi FIS World Cup comes to Squaw Valley March 9 – 12, her generous spirit and exemplary citizenship will earn her a place on the World Cup stage. Anika will be participating in the opening ceremonies and handing medals to some of the female athletes she’s looked up to since she was two. She’s just one of the girls from the Squaw Valley | Alpine Meadows ski team selected to be featured in an opening ceremony designed to honor the spirit of female mentorship that the World Cup embodies and kick off a weekend celebrating girl power and fierce female athletes. 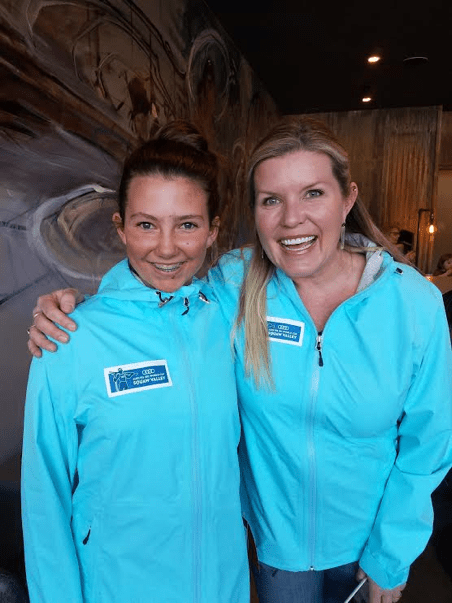 Kirsten Pekarek (right), teams’ World Cup coordinator for Squaw Valley | Alpine Meadows, presents Anika, 12, with the commemorative jacket she’ll wear when participating in the Audi FIS World Cup opening ceremonies at Squaw Valley | Alpine Meadows Thursday, March 9 at 4:15 pm. The selection committee read through more than 70 essay applications to arrive at the group of girls who will be skiing down Squaw’s Red Dog face Thursday and Friday, presenting flags from the participating countries. Tamara McKinney, the first woman to win the Overall World Cup title, Kirsten Clark Richenbach, a World Cup and Olympic alumnus and Lorna Stucky, vice president of Squaw Alpine Association, were so impressed and inspired by the strength of the applications that nearly 60 girls from Squaw Valley | Alpine Meadows will be participating. Don’t miss the opening ceremony Thursday, March 9 at 4:15 pm. Plan your trip and learn more about the weekend’s events at squawalpine.com/worldcup.